Slathering your dirty face with oil or an oil-based cleanser?? Sounds awkward right?? Cleaning your skin with oil may sound like a really bad idea, but guess what? It’s not. 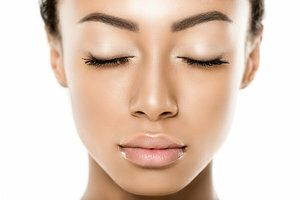 Oil cleansing has actually been around for years and it’s the science behind most eye make-up removers. When you think about applying oils to cleanse, it may seem counter-intuitive, especially if you're already oily but once you get passed the idea the evidence is clear. Why does this idea actually work? Well, you can call it the law of attraction and basic science at work here. Oil attracts oil and helps to break it down and create surface tension. As you cleanse with a fatty based oil, you are massaging the facial tissue in circular motions which allows it to latch onto excess toxins, remove dirt, increase circulation AND bring nutrients to the skin. Then the best part- A warm / wet cloth hauls away the gunk and your skin is left with the ideal amount of moisture. Giving yourself a facial massage is something that we don’t do often enough, but this simple self-care treat plays an important role in keeping your skin young, radiant, and healthy. 1. Massage a few drops of your favorite oil / fat-based oil cleanser in small circular motions on your face and neck and don't forget your eye make-up. 2. Allow the cleanser to penetrate for about a minute or 2. 3. Using a warm, wet washcloth, begin at your neck and wipe away the cleanser and the days pollutants in UPWARD motions until you've reached your hairline. *Rise your cloth frequently throughout the removal process. Keep up with the latest product drops, freebies limited offers, and pop-up event info—straight to your inbox. © 2019 skin the essentials llc. all rights reserved.